I’ve given Rory (9 months) spiralized carrot and courgettes before and they were just played with and then thrown away. 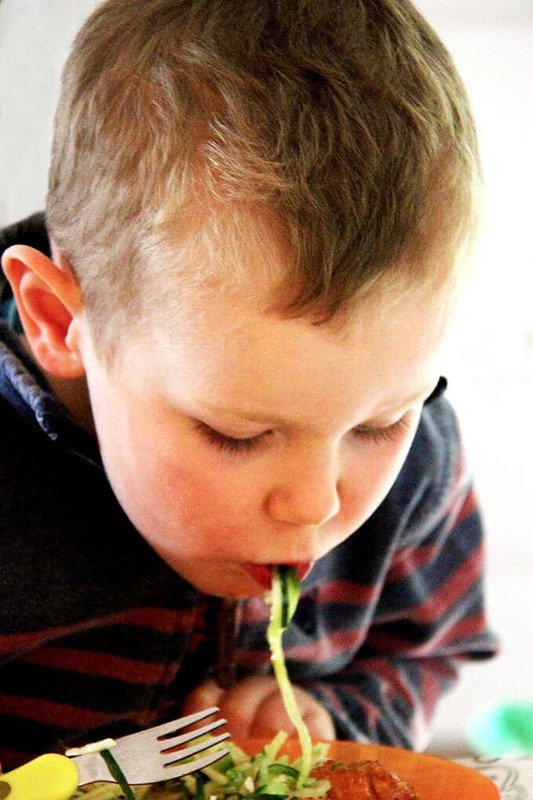 So when I gave him some of this salad I expected the same – to find the noodles stuffed down the side of the high chair or scattered over floor. However, this wasn’t the case. He managed to eat it no problem and there was very little waste! 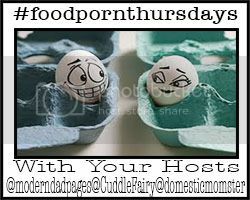 The softer texture of these noodles obviously helped but I think he enjoyed the sweetness of the apple too. I like to make this ahead of time and let the marinade soak into the noodles. It tastes delicious after a couple of hours and straight out of the fridge. 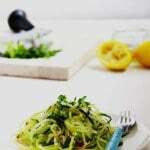 If you don’t have a spiralizer then you could finely slice or grate the apple and cucumber. A fresh salad with a little sweetness to keep the kids happy. 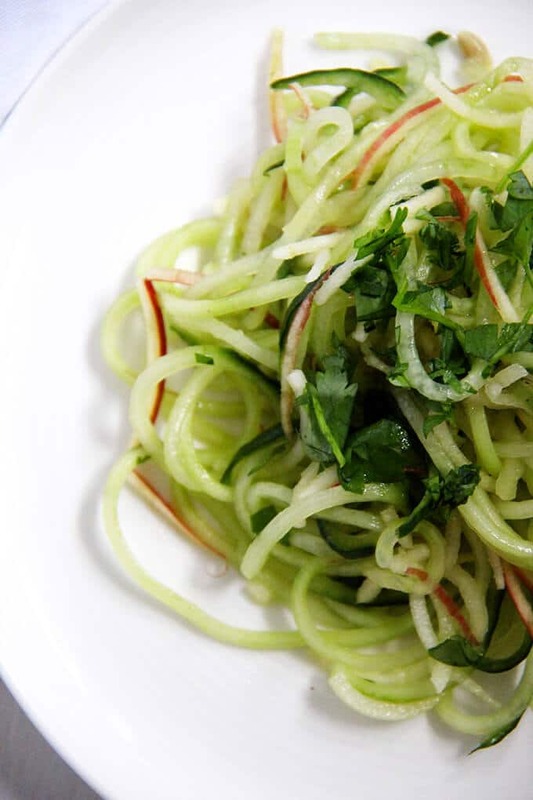 Spiralize (or grate) the cucumber and apple then combine in a bowl with the coriander. Mix the lemon juice and oil together and pour over the cucumber and apple. Toss to ensure all the noodles are coated. What a great idea! 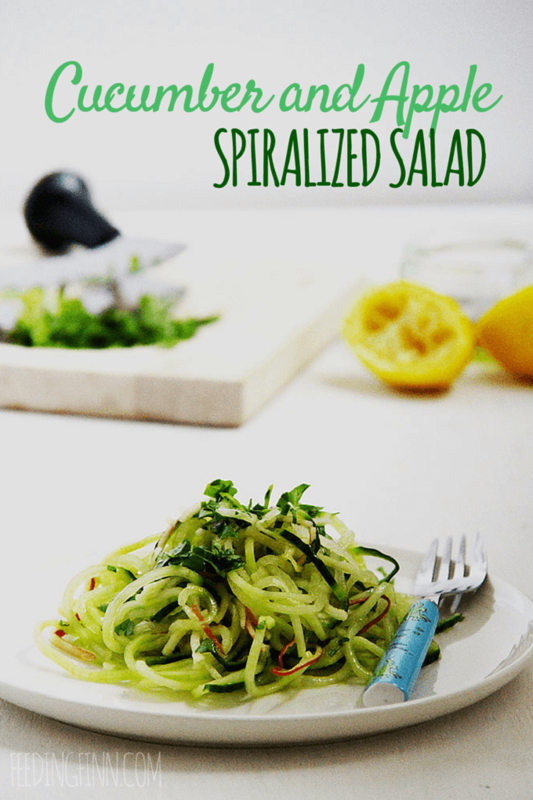 I need to jazz up my salads, think I will invest in a spiralizer. Thanks Carly, def worth buying. I use it tons. I haven’t got a dehydrator. Do you find you use it a lot? that looks yummy, I think I’ll try it on my kids! Great! I wish I could enjoy it in the BVI! Lovely photos and what a great simple recipe! I could see this doing really well at a BBQ with some spicy chicken! Thanks Vanessa, yeah that sounds like it would work nicely. I think I will do that too!